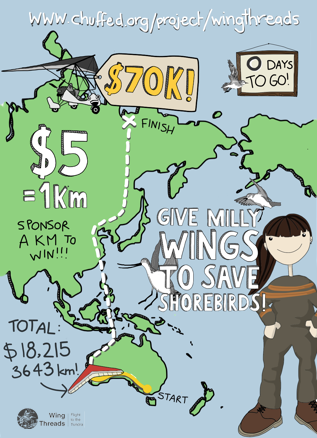 Wader Quest: Marvellous Milly wing threads fundraising update. Marvellous Milly wing threads fundraising update. The Wing Threads: Flight to the Tundra crowdfunding campaign came to a close yesterday having reached over 25% of our target for a final total of $18,215! In our last week, we received an extra $4268! Thanks to your generosity, we are 3643km closer to the Arctic tundra. It is incredibly heartening to know that so many people believe in this project and thanks to your help, we are one big step closer towards making it a reality! We hope you have enjoyed the cartoons and films for the campaign as much as we enjoyed bringing them to you! If you missed some of the videos on social media, you can check them out and subscribe to the Wing Threads YouTube channel. We'll be continuing to bring you more cartoons and videos in the future. You can stay up to date by subscribing to the Wing Threads blog at www.wingthreads.com. Over the next few weeks, we'll be organising incentives and getting them ready to ship to your eager hands! We're aiming to have them all sorted and sent by the end of June. If you're sad that you missed out on some awesome 'Meet the Shorebirds' magnets or a rad as 'Stints are Rad!' t-shirt or tea towel, never fear, as we'll be setting up a store on the Wing Threads website in the near future. All proceeds from sales will go towards the flight. Following on from the success of the crowdfunding campaign, I am now going to apply for funding through other sources to make up the difference for a microlight aircraft and other costs for the Wing Threads adventure. During this time, I will also continue planning for the flight and focus on flying solo for my pilot certificate to work towards obtaining my passenger and cross-country endorsements. As such, other than a few public presentations, I will be off the radar for the most part for the next six months or so, but will provide updates when there is exciting news! Last, I just wanted to give a special shout out to say thank you to all the organisations and folks who donated perks to the crowdfunding campaign - BirdLife Australia, the Bitterns in Rice Project, Pukorokoro Miranda Shorebird Centre, Sky Sports Flying School and to fellow artist, Kate Gorringe-Smith. I'd also like to say a special thank you to The University of Western Australia for hosting the campaign and to Wild Melbourne for volunteering their time to produce the promotional film and support on social media. You're all totally awesome! I cannot thank you enough. Ok, that's enough gushing from me! Thanks once again for your amazing support of Wing Threads: Flight to the Tundra and I look forward to continuing to share this journey with you.